'The Gold of the Incas' ~ Quinoa... wonder grains from South America. 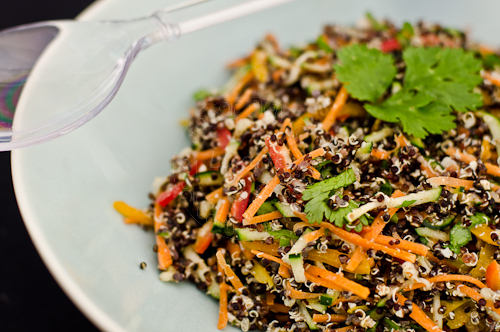 I will not elaborate further on this wonder grain... just click here to know more about Quinoa. These tiny grains contains so many 'properties' that are beneficial to our 'well being'~ it helps eases migraine headaches good for me, cardiovascular and many more.. Click here to find out more on the 'health benefit' of Quinoa. It was nearly lunch time... and the lunch crowd was growing by the minute... no hope of us getting any seats anywhere in the Food Court ... so we decided to grab some lunch at David Jones instead. My lucky star must be shining so bright on that day... DJ's Salad Bar had Black Quinoa Salad... I had to have that salad!!! I was blown away by the taste and the texture, that I had to write down all the ingredients that I could 'see and taste' on my serviette can't always rely on the rusty CPU up in my head anymore, you know. 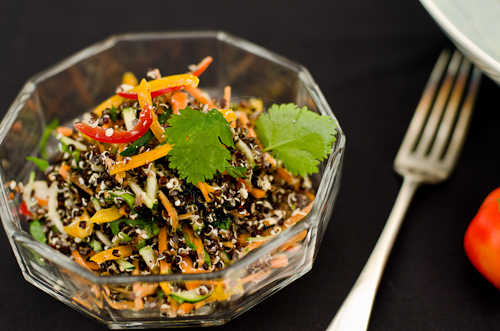 Its like... South America meet Asia... crunchy nutty bits of Quinoa with a hint of ground cumin and fresh coriander... beautiful ... beautiful... beautiful salad. and one more thing worth mentioning ~ the salad tasted even better the next day!!! Roast cumin in a frypan (dry roast) until fragrant. Then ground the cumin. Cut the carrots, zuchini, capsicums into matchstick size. I love quionoa too! This salad looks so healthy, colourful, and inviting! Agree, your quinoa salad looks beautiful. I like this simple, healthy recipe, thanks! I smell something cooking and it smells good, lots of yummy recipes in here, will visit again next time. Btw, thnks for visiting and leaving such a nice comment on my blog. 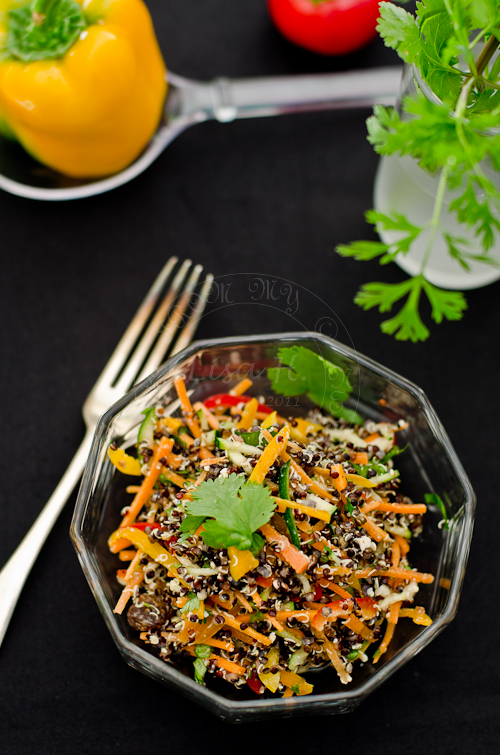 I have never seen or heard of black quinoa.Looks amazing with colorful veggies! The spices used.. will make a lot of difference..
A splendid salad! So colorful and healthy.